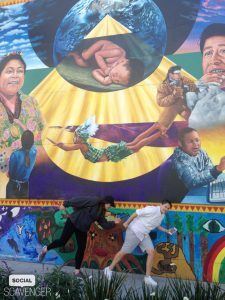 Venue Description: A fantastic area for a corporate teambuilding event, the sunny, quirky Mission District is the cultural heart of San Francisco, largely unknown to the tourist crowd and the launching pad for all things new and alternative. Neighborhood: Dating back to 1776 and the building of Mission Dolores (featured in the Hitchcock film, “Vertigo”), the Mission District is San Francisco’s oldest and most culturally diverse neighborhood. Home to the City’s largest Latin American population, the Mission is a flamboyant and extroverted place, magnet for young people, actors, poets, musicians and families alike. Chic boutiques, ethnic restaurants, sizzling night spots and political bookshops abound in the Mission, along with cutting-edge theaters and literally dozens of vibrant murals embracing Hispanic heritage and civil rights. Gather at Alioto Mini-Park, Capp Street @ 20th. See more San Francisco Corporate Team Building Events.